This book collects recent and creative theorizing emerging in the fields of curriculum studies and curriculum theory, through an emphasis on provoking encounters. Drawn from a return to foundational texts, the emphasis on an ‘encountering’ curriculum highlights the often overlooked, pre-conceptual aspects of the educational experience; these aspects include the physical, emotional, and spiritual dimensions of teaching and learning. The book highlights that immediate components of one’s encounters with education—across formal and informal settings—comprise a large part of the teaching and learning processes. 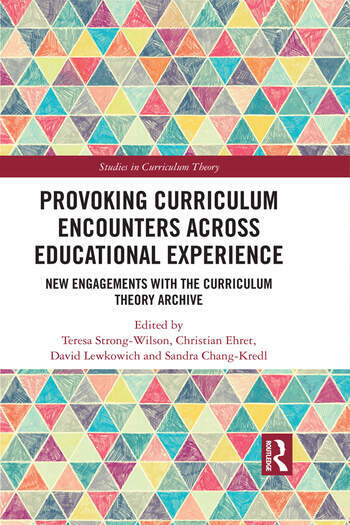 Chapters offer both close readings of specific work from the curriculum theory archive, as well as engagements with cutting-edge conceptual issues across disciplinary lines, with contributions from leading and emerging scholars across the field of curriculum studies. This book will be of great interest to researchers, academics and post-graduate students in the fields of curriculum studies and curriculum theory. Teresa Strong-Wilson is Associate Professor in the Department of Integrated Studies in Education in the Faculty of Education at McGill University, Canada. Christian Ehret is an Assistant Professor at McGill University in the Department of Integrated Studies in Education, Canada. David Lewkowich is an Assistant Professor in the Department of Secondary Education at the University of Alberta, Canada. Sandra Chang-Kredl is an Associate Professor in the Department of Education at Concordia University, Canada.